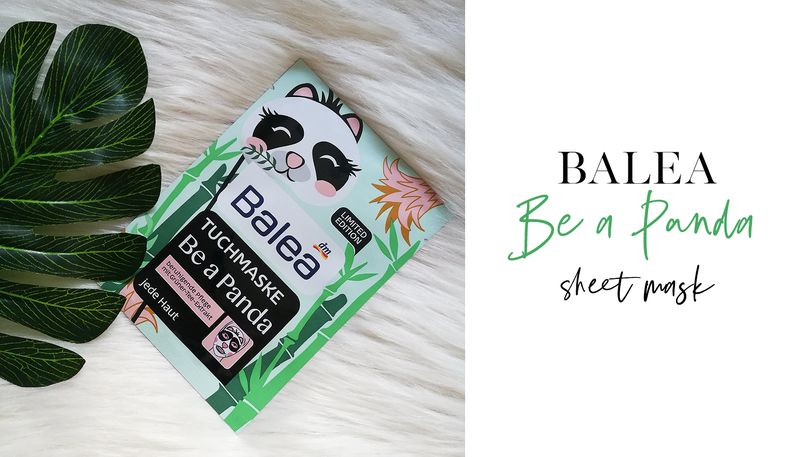 BALEA Be A Panda Sheet Mask - Cherry Colors - Cosmetics Heaven! 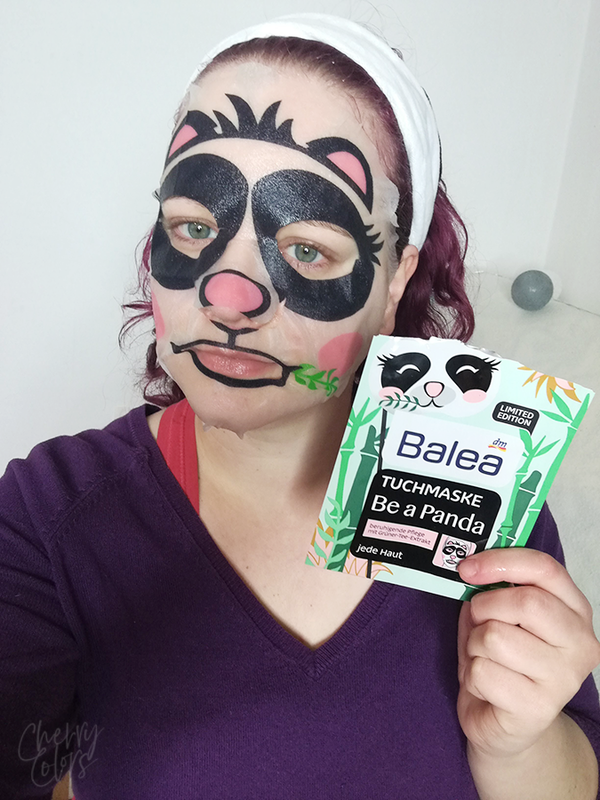 When I went to our local DM the last time I found two interesting products - One was a Tiger Sheet Mask and the other was this Panda sheet mask. I'm a huge fan of sheet masks and well, I've never tried one with a cute design on. I know it's stilly, but I wanted to try one of these as soon as I saw them. Plus the cheap price is always a great plus and this one was priced at 2€. Let's see how it performed. 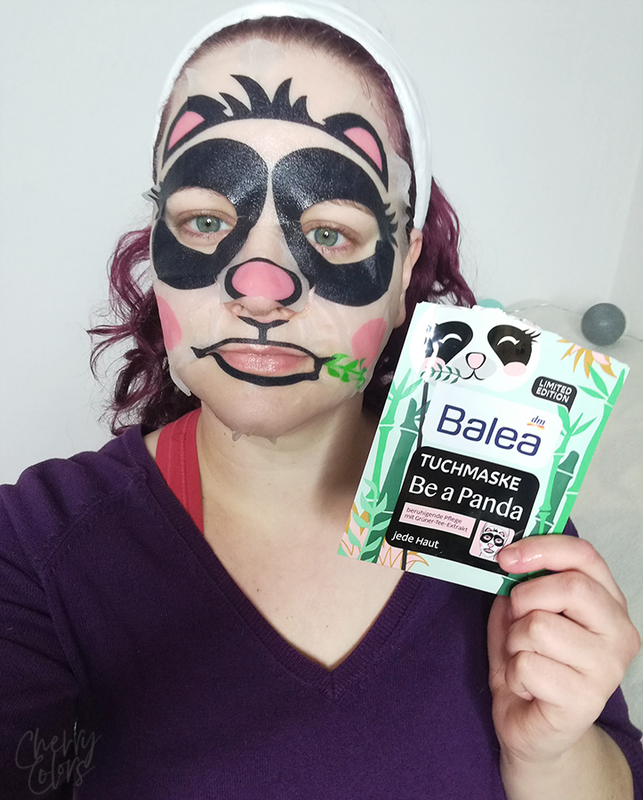 The innovative Balea cloth mask Be a Panda delights with its stylish panda print. It provides soothing care with green tea extract. The mask comes packaged in a pretty bag that was easy to open. This time to store didn't stick the translated stickers on the seams and that made is so much easier to open. 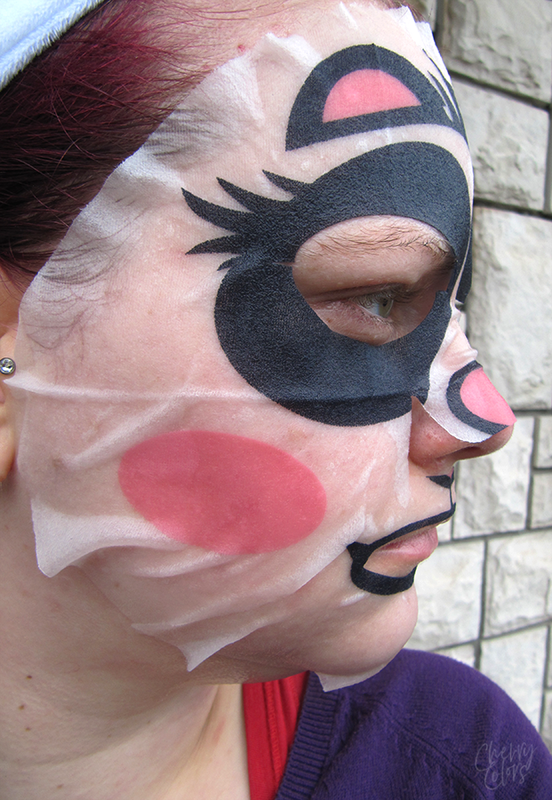 The mask is pretty thin and soft except for the parts where the prints are. On the prints, it's a bit thicker but it's not unpleasantly thick. The mask is fully soaked in the serum inside but there is no excess serum left in the baggie once the mask is taken out. Remove the cloth mask and place it on the cleansed face. Leave for 10-20 minutes and remove the mask. Massage remainders gently. I found that it fits my big face pretty well. The most problematic was the mouth area, but it was nothing I couldn't work with. For some odd reason, the mask had quite a strong scent but it wasn't an unpleasant scent. It was fresh and luckily it dissipated quickly once I applied the cloth on my skin. I haven't noticed the scent of the Tiger Mask. 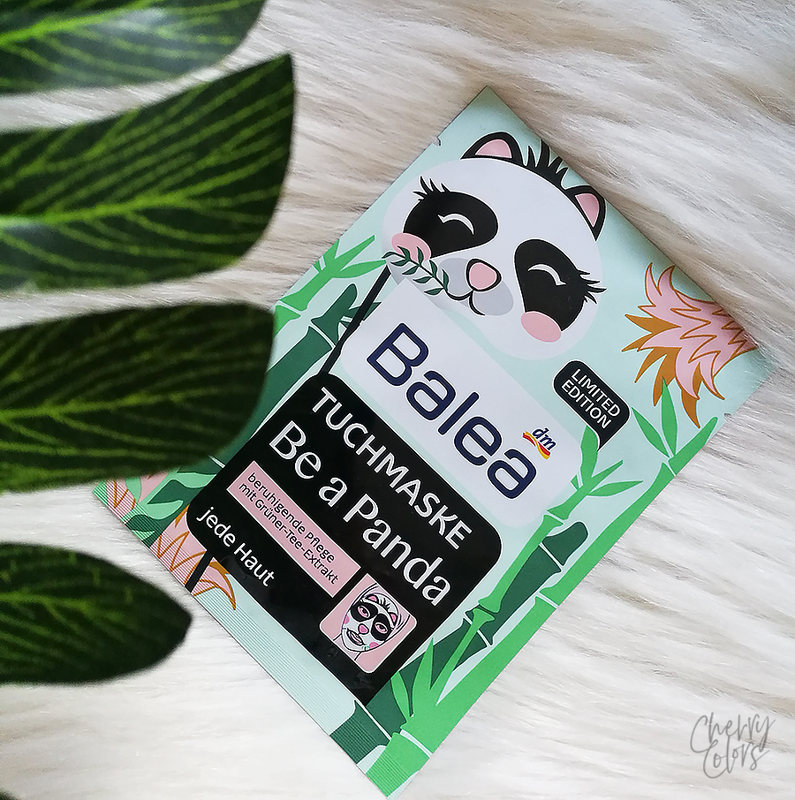 I am usually not a fan of Balea's sheet masks. Mostly they are too hard, too thick, too uncomfortable and they don't do a thing for my skin. But not this one. This one moisturized my skin heavily and it was probably the first time that I didn't have to use my Kikumasamune toner after a sheet mask. For a moisturizing mask, it's brilliant. I loved it! You can read more about the ingredients on Skincarisma. As I said, I am not a fan of Balea's sheet masks but this one takes the icing from the cake. It's very hydrating and fits well. It's soft and has a cute design. What more would I want from it? Well, if I get to chose, I'd say that they should've put the serum from the tiger mask with the sheet of the panda mask. Because I feel the formulation of the tiger mask was better but that mask was thicker on the heavily printed areas. Overall I enjoyed this mask. I hope they put it with the regular edition masks. Have you tried it? Let me know in the comments below.